Create a customised HTC One M9 hard case. Print your favourite memories with a photo or design. Your own personalised phone case to impress your friends. Why should I choose for a hard case? The personalised HTC One M9 hard case is one of the most robust cases we offer. If you are a looking for solid protection against scratches and dents for your HTC, then you have found the perfect case. Not only does it offer your device its much need protection, it lets you add a personal touch of style. You are free to design that case how you please. There are no more excuses for walking around with an ugly phone case. Get started on your personalised HTC One M9 phone case now! 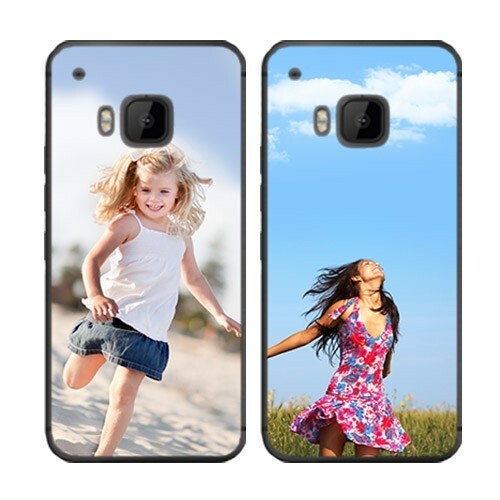 Here at GoCustomized we have a true passion for mobile phone cases. We believe that everyone has a unique sense of style that he or she expresses in many different ways. You pick your shoes, cloths and jewelry to express your personal style but you walk around with a phone that looks exactly like the persons next to you? That just can't do. To get make your own personalised HTC One M9 phone case all you have to do is start by selecting your base colours. This is the colour that will remain visible on the sides of your personalised phone case. Next, upload an image straight from your PC, tabet or smartphone. You can also upload images straight from your Facebook and Instagram account. Once you have found the perfect image, finish it off by adding a little text personal text. As you can see you will have your personalised HTC One M9 case finished in minutes! How long will it take until I can use this beauty?